In a potentially promising development, President Obama’s Principal Deputy Commissioner of Food and Drugs testified in support of a bill that would ban subtherapeutic antibiotic use in animals. The reason: pumping animals full of antibiotics is bad, bad, bad. In addition to the systemic animal abuse such drugs enable, their downstream environmental impact is clear, obvious, and chilling. I have blogged at some length about this issue (e.g., here and here). The AMA, the Union of Concerned Scientists, and the Pew Environment Group (among others) all back the proposed measure . Should we then hope? Of course not. Big Food opposes the bill and, as the NYT notes, that opposition alone will probably spell its doom. I’m writing a piece about CAFOs and climate change for the Animals & Society Institute, which, as you might imagine, is not a cheerful pursuit. Still, even with all my carping about antibiotics in animal feed, I had not realized that vegetables like corn, potatoes and lettuce absorb antibiotics when fertilized with livestock manure. Usually, one hears about antibiotic transmission through meat and dairy products. I was even more disturbed to learn (all of this from the Environmental Health News) that eating organic offers no protection — though, given the way USDA organic certification has been canted in favor of Big Food, I should have guessed. This information about contaminated produce comes from a 2005 University of Minnesota study where researchers planted corn, scallions and cabbage in manure-treated soil and a similar 2007 study on corn, lettuce and potatoes. In each case, the crops were found to contain antibiotics (chlortetracycline and sulfamethazine, respectively). The reason organic certification offers no protection lies with lack of USDA restrictions on using manure from animals treated with antibiotics. Since 90% of the drugs administered to these animals gets excreted in their urine or manure, which then gets spread on soil used to grow vegetables, the vegetables absorb the antibiotics. Eventually, so too do we. According to the Union of Concerned Scientists, animals receive over 25 million pounds of antibiotics each year in the United States. Recommendations abound to mitigate the problem, although none have so far been implemented. Some mitigation strategies offer significant cause for concern. For example, some suggest high temperature composting, which can reduce antibiotic concentrations significantly. However, it has no effect whatsoever on concentrations of sulfamethazine, a commonly administered drug. Such proposals terrify me because, even if implemented, they will not fix the problem while likely giving Big Food a free pass to continue using antibiotics indefinitely. Don’t get me wrong; I favor high temperature composting. It’s part of any sustainable agriculture program and one of many steps necessary to combat climate change. However, it will not solve the antibiotic problem. The solution to this particular problem is simple: Ban subtherapeutic antibiotic use in agriculture, much as Europe did in 2006. The status quo is incredibly dangerous, both to humans and the environment at large. A ban represents a straightforward solution that no one in this country with any juice will entertain. Big Food argues that the drugs are necessary to its continued operation. Even if that were true (which it is not — the National Research Council estimates that a ban on subtherapeutic antibiotics would increase per capita costs a mere $5-10/year), so what? Industrial Agriculture brutalizes billions of animals in indescribable ways and forms one of the chief sources of greenhouse gases (CO2, CH4 (methane) and N2O). It also causes widespread environmental degradation and disease, including the swine and bird flu. I’m hard pressed to come up with a reason why its continued existence should be a national priority. In other less newsworthy matters, the FDA has reversed itself and decided to permit “off label” prophylactic use of cephalosporin antibiotics for industrial, confined “food” animals. Off label use refers to administering a drug for purposes other than those for which it was tested and approved. The FDA approved cephalosporin for treating respiratory illness in cattle and pigs as well as for a variety of human illnesses. However, the animal industry had been making widespread use of it in other animals and for other uses. 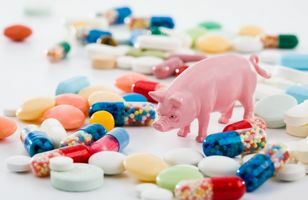 Faced with the growing crisis of antibiotic resistance, the FDA had determined in July that using one of a dwindling number of effective antibiotics prophylactically and for other non-approved purposes in animals did not make sense. It announced a ban on such behavior beginning on November 30th but withdrew the ban four days before it was to go into effect. Apparently, Big Food and its allies were concerned that eliminating off label use would cause animals to suffer needlessly. Read about their compassion here. Of course, empathy does have limits. For example, the possibility of not confining the animals in such close proximity apparently did not merit discussion. Cynics among us might view the campaign to quash the rule as part of a coordinated campaign by Big Food and Big Pharma to maintain the profitability and preeminence of industrial agriculture despite ever-increasing human health risks and ongoing, routinized animal torture. Those cynics might also view the FDA’s capitulation as a glaring example of agency capture. Hat tip to the Marler Blog for its disturbing and informative post on the cephalosporin issue.